Most of the time when you go shopping in the USA, the person behind the counter automatically puts your purchased items in a plastic bag. That’s a bad default. Instead, they should provide a bag only if you ask. I’d go so far as to say they should charge you for that bag. Then many would begin bringing their own bags. In 2007, San Francisco was the first American city to ban the use of plastic bags. 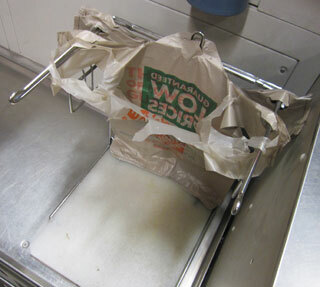 775,000 gallons of oil were used to make the plastic bags San Francisco used the year before. (Info from SFGate.com.) Think of what a positive impact their legislation has had! The only good thing to be said for plastic bags is that they keep plastic bag manufacturers in business. And provide jobs. However, that’s the same logic as saying it’s good to keep making high-alcohol sugary pop drinks that appeal to teenagers – because those companies employ many people. Occasionally I do get a bag, when I forget to bring one with me. I’m not trying to be legalistic – but I am hoping that if you buy and use reusable bags, you will enjoy the positive impact you’ll be making. I give my brother credit for the idea for this post. Thanks Bill! I like the fact that South Africa charges for these obnoxious carrying devices. It’s not much but enough to help one remember to bring one’s own bags. With Nakumatt and Uchumi plastic bags rapidly becoming both the national flower and national bird of Kenya (and other African countries), Kenya needs to following the SAf example. Besides the waste of resources associated with plastic bags, they can have a very literal “environmental impact” too. The place where I worked from 2000-10 was on a former military base surrounded by a chain link fence. Across the road from the base is a shopping center. Every couple of days someone would have to walk the facing length of the fence, removing a lot plastic shopping bags that had been blown in there by the wind. Now that I have an Aldi (German grocery) in the neighborhood, I take my own bags along. I reuse regular shopping bags as trash and cat litter bags and don’t buy regular trash bags. Bill: They clog drains too. Tim: Aldi’s is great. And reusing them as trash or litter bags is a good second life. I almost always take my own bags to the grocery and other stores. My pet peeve is that the baggers often don’t know how to pack them, so they are either too full, not full enough, or something gets squished! In Australia we are encouraged to use our own bags, although they are still free in most supermarkets. Target charges for their bags, whch are compostable now. I must admit I always get caught out at Aldi though and end up scrounging for a cardboard box they often leave out for customers to use. I have a cupboard full of ‘green’ bags, and they have become a popular gift recently. I have some lovely silk ones. Good one Paul. I remember in the 1990s that Sainbury’s used to give you 1p if you used your own bag (they’ve stopped doing that). That was a good incentive when I was a poor student. Personally, I just try to make sure all my coats and a back pocket of my trousers (US: pants) have a bag. except in the grocery stores, where your own canvas bags are encouraged, in alaska the merchants ask if you’d like a bag. i was a bit surprised when we first moved here – pleasantly so – by this practice. but when i purchasing a small item there really is no point for a bag when i can simply store it in my purse.